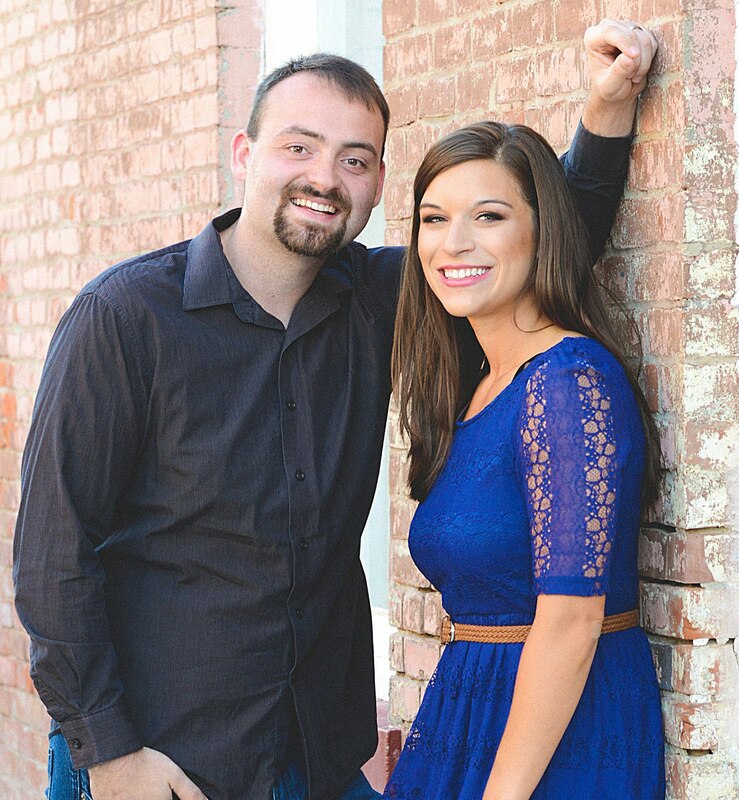 If you've been around for a while, you know that I LOVE all things rustic, farmhouse, and "Fixer Upper" when it comes to home decor. (If you need a little proof, check out our Rustic Dining Room and Farmhouse Living Room.) I love adding light and brightening a room without having to tackle painting all of our oak trim, and thus I've repainted a lot of furniture with pale greens, whites, and pretty neutral pops of color. But what's a girl to do when working with unfinished or older wood? 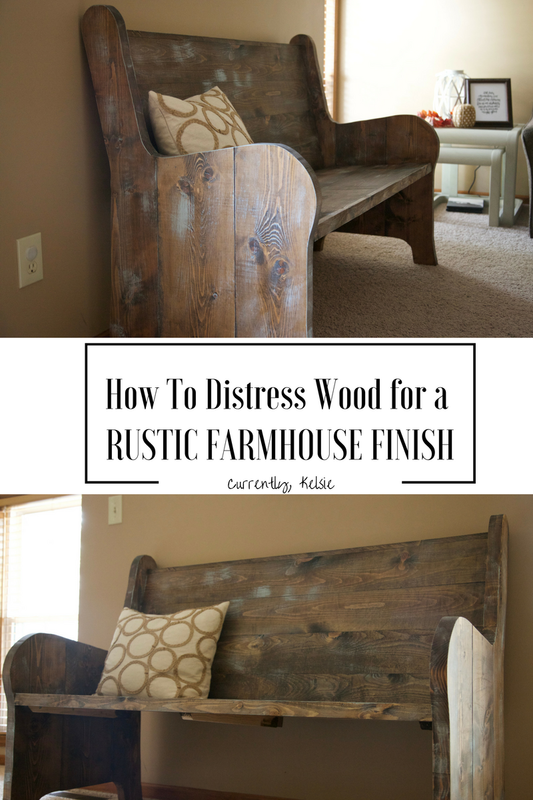 Distress it to look rustic and add some character, of course. 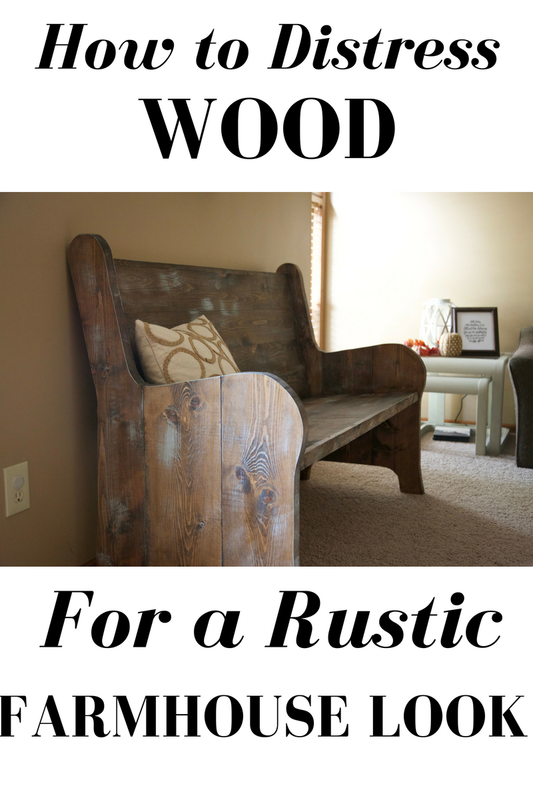 Here's how you can make your wooden furniture look old and farmhouse fresh. 1. Make sure the wood is sanded, clean, and dry. My hubby built me this new beautiful church pew as a surprise gift. 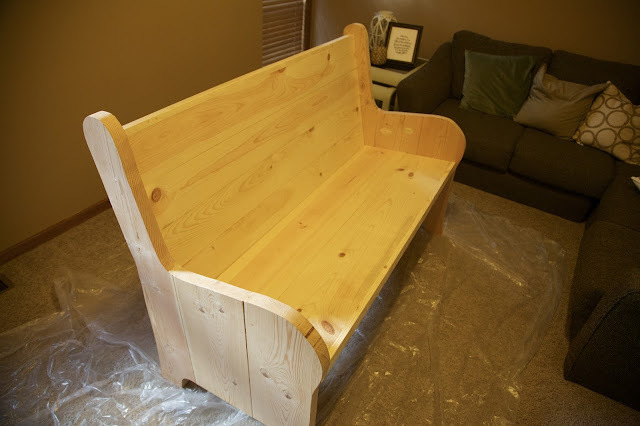 I'll demonstrate the process with it, and if you love the pew as much as me, he can actually build you one. Just contact me on Facebook or through the Contact Form for more info on available sizes and pricing! It's my favorite part of the room. 2. Choose your stain, apply, and rub off. 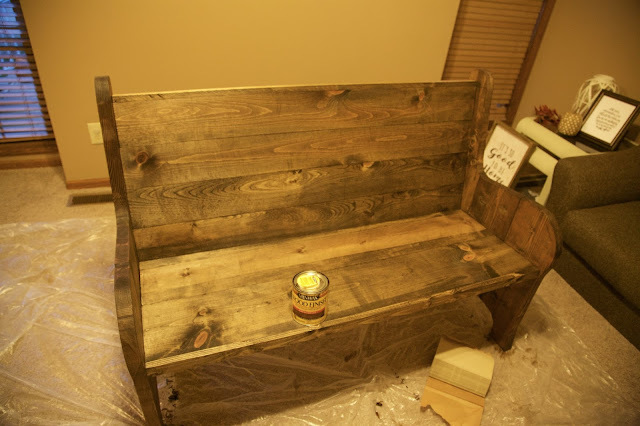 I initially thought I wanted to go with white stain for the pew, but decided that I'd rather go with the deep brown stain color that we used for our rustic centerpiece. 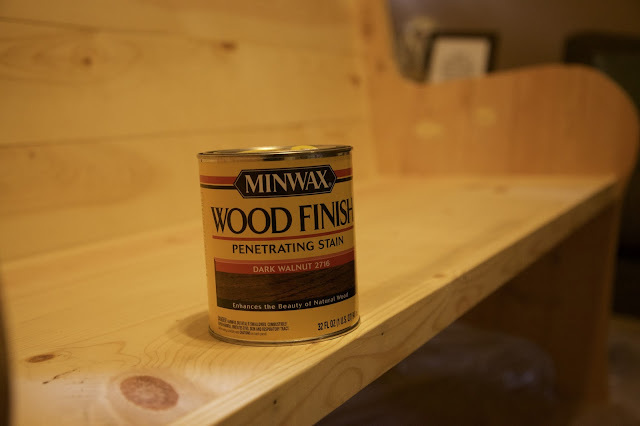 We chose Minwax Wood Finish Dark Walnut Oil-Based Interior Stain. Just use an older brush to do this, knowing that it won't be of much use for other paints after you use it to stain. Be sure to put down a drop cloth- stain will ruin clothes and carpet. After letting the stain sit for 30+ seconds, depending on how dark you want it, you will need to use a rag to rub off some of the excess stain and build texture. This is very important for the proper rustic look! 3. Let the stain dry for a day or two, and choose your favorite chalky finish. 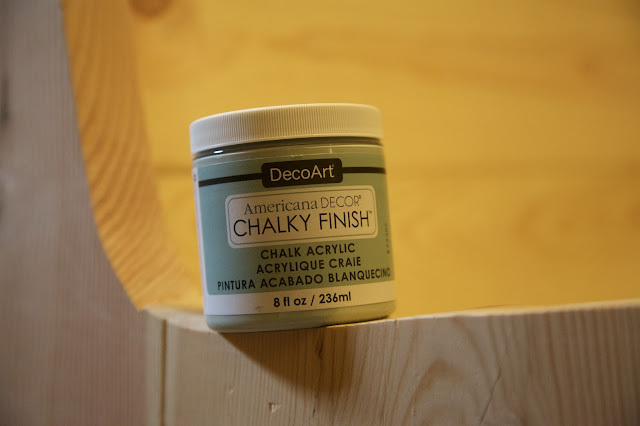 While we let the stain soak, we landed on a dreamy chalky finish from Americana DECOR by DecoArt. The color we chose was "vintage", a pale blue gray. Keep in mind that the chalk paint you choose needs to be lighter than your stain or the current wood color in order to create a rustic look. 4. Apply the chalk paint using "dry brushing" strokes. Use short, quick brush strokes in a variety of directions, and add a little more paint as you get more comfortable and reach your desired look. If you don't have new wood, you can simply skip to steps three through five, and use a chalky finish to add some texture and color to your wood! That's it! I love how our pew turned out, and I'm excited to "finish" the new kitchen island my husband also built me before Baby K comes in a few months! I love the way that we can make brand new wood look old and full of character. Let me know if you have any questions! Are you a rustic farmhouse home decor lover too? Check out my board on Pinterest for some inspiration and dreamy looks I'm loving! I so need to try this! 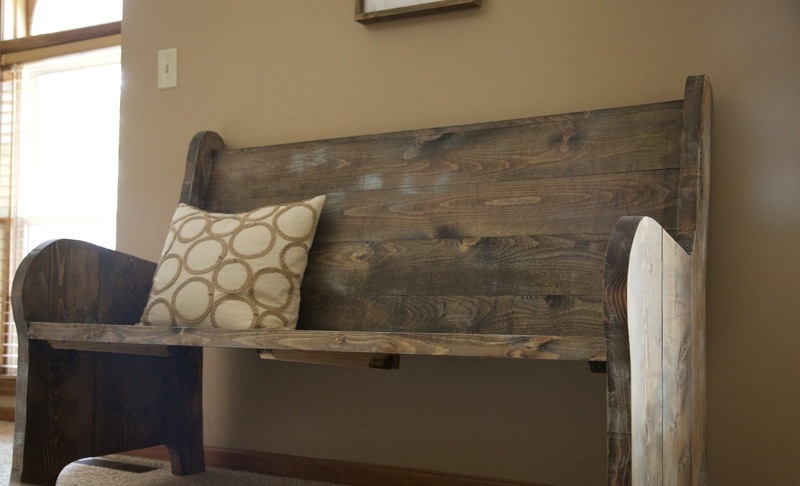 I'm currently a little painted out from refinished ALL of the nursery furniture, but I may have to find something to distress because I love the look of your pew! Yes!! I love distressing stuff! 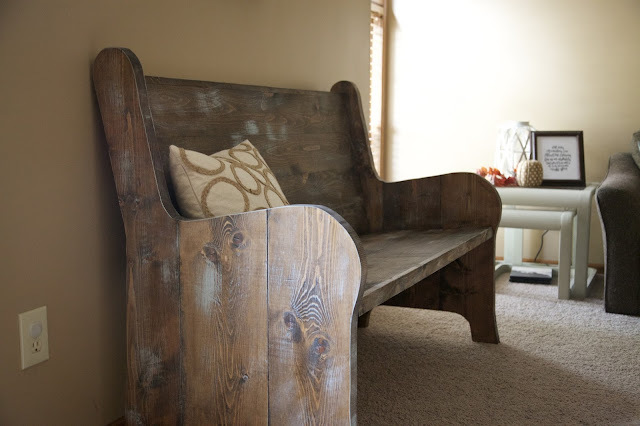 This is a gorgeous piece of furniture, and the rustic finish is beautiful! Pinned! Thanks! I'm so happy with how it turned out! Thank you! It does take patience and is kind of nerve-wracking! I love this look! I had no idea it was brand new when I first saw the pictures! You did a great job making this look rustic! Thank you! That's the goal! 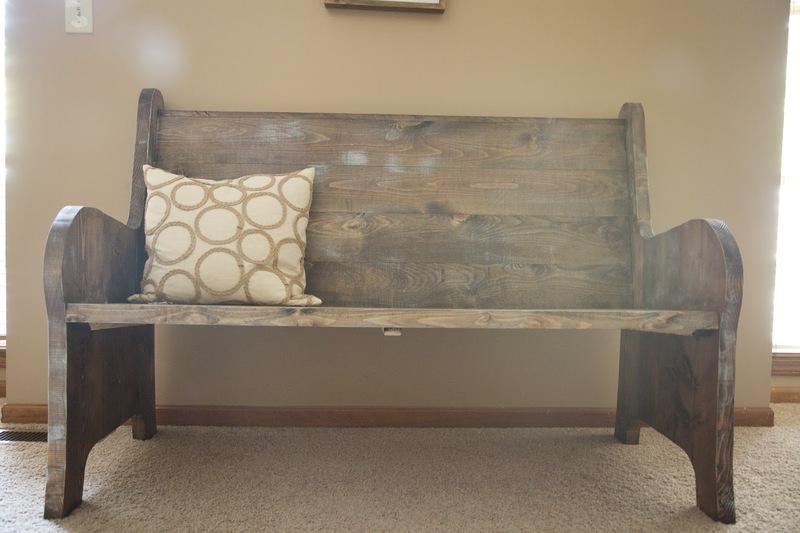 This bench looks amazing! I love seeing all the rustic touches in your home. It motivates me to keep working on mine! Thank you, friend! Finishing the nursery next and then I'm dreaming of our bedroom! Your bench looks so beautiful! We just bought our first home and I'm excited to actually be able to do more DIY projects. Thank you! I love DIY stuff! Thanks Crystal! Give it a whirl!